“Bombay Jayashri Ramnath was the first artist to be brought to the shores of Sydney by Pallavi fifteen years ago” said Mohan Ayyar as listeners flocked to the Ryde Civic Centre to listen to her accompanied by violinist Embar Kannan and Mridangist Vaidyanathan yesterday. The audience were welcomed by Pallavi with Jasmine flowers and a tiny idol of ganesha, in keeping with Pallavi tradition and the programme started on time. The stage was adorned not with one two but three tanpuras. On the two tanpuras were Sydney singer Aruna Parthiban and Melbourne’s upcoming youngster and student of Shobha Shekar, young Sakthi Ravitharan and Bombay Jayashri’s pleasant smiles as Mohan Ayyar welcomed the audience on a very special Valentines Day. As Bombay Jayashri commenced the evening with a Natai in “Jaya Jaya” and moved on to Sahana in “Vandanamu Raghunandana” I remembered the Bombay Jayashri of yester where in a four hour Pallavi concert in Sydney University’s theatre I soaked in many great compositions and a memorable RTP in a complicated rhythmic cycle. The Bombay Jayashri of that era was a keen enthusiastic performer who put on a marvelous show with rhythmic complexities in a melodious rich energetic voice. Today Bombay Jayashri is a phenomena her music has an effortless, seamless quality resting within meditative folds. As she moved into Dharini Telusu in Shuddha Saveri, did the audience miss the varnam? Apparently not. She then launched into a melodic journey of Nalinakanthi, the raga bhavam in the top octaves was rendered in fast phrases usually explored with zest by any violinist, Embar Kannan showed enough restraint. A vocal rendition of the most popularized instrumental number ‘Manavyalakim’ was thrilling yet her music seemed rested and sedate which became more pronounced in “Sri Narada Nadha Sarasi Rugha” Thyagaraja’s kriti in Ragam Kannada and with the full exploration of a masterpiece in Ragam Bhairavi in the Swarajathi of Shyama Sastri’s “Kamakshi Amba” with a neraval on the top octaves on “Shyama Krishna Sahodari Shiva Shankari”. This was followed by some light pieces such as Bihag mentioned in the preview of the programme on Sydhwaney “Muruganin Marebayar Azhaga” one of my absolute favourites. Bihag has never been treated as beautifully as in this song, it feels like a slow sunrise over the horizon as the song unravels itself. The programme finished with a thillana in Sindhu Bhairavi perhaps a composition of her Guru Lalgudi Jayaraman. As two little girls rushed onto the stage to honor the artists Pallavi volunteers had a long night ahead of them and an even more promising year ahead as they announced the next Pallavi concert to be held on 1st August 2010 of Gayathri Venkataraghavan with Akkarai Subbulakshmi on Violin and Manoj Siva on Mridangum at Ryde Civic Centre. 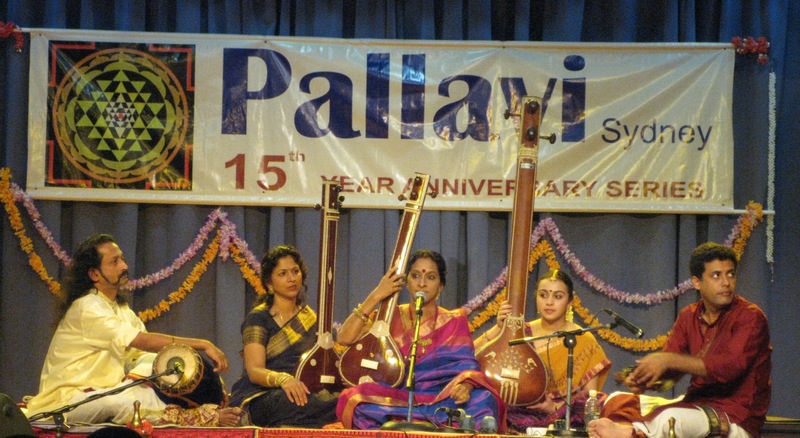 More about this concert under the Events page and www.pallavi.org. Sydhwaney congratulates Pallavi on its 15 year achievement.